Over the years, I have learned many things about the word "value". There is a generic description for it found in any dictionary, but to each and every one of us we interpret it a different way. We also tend to alter our views on values as we grow older, holding new things in higher esteem as we mature enough to appreciate them more than in our youth. For example, take your first autographed baseball card you got as a kid. Boy was it cool for the first day or so! But, sooner or later, it ended up close pinned to the front fork on your bicycle to make a very cool sound. Now, if I had that rookie Rod Carew signed baseball card today, you better believe that it would have never seen a second outside of a plastic sleeve! We also can appreciate value when it comes to traveling and selecting an outfitter for our hunting needs. When I was younger growing up in Minneapolis, my friends and I would become the ultimate hunting know-it-all when the season came upon us. We would open the state map, the walk-in atlas, and anything else we could find to select our Mecca of choice-you know, the one that when your finger is on it on the map visions of numerous flushes and full game bags immediately filled your mind. And, even when you spent hours driving, finding a hotel room, a place to eat, somewhere to cold store your bag (if you had any!) and end up coming home with one bird, you still saw it as a value. Now that I am older, hopefully wiser, I have learned the value of hunting with a good outfitter. Sure they are costly, but the expense is well justified. I've heard many "weekend warriors" say, "I'm not going to pay to hunt, I can figure out where to go by myself." Realistically, the bulk of them can't. There is little point to driving hundreds of miles for a long-anticipated hunt only to run into posted signs, fumble around in strange country for week, spend a lot of money on gas, motels and meals. All that just to shoot two or three birds and then drive back home! A much better deal is to book with a quality outfitter and shoot a limit each day and have a good time doing it. The bottom line: The difference between a fine hunt and a lousy hunt is the couple of hundred extra dollars paid for an outfitters services. Location - Where do I want to go? Am I willing to fly or drive? How is the habitat this year? How was the spring hatch? How was the winter? What is the weather like in this area during the hunting season? What amenities do I want? - Full lodging, meals, game cleaning, etc? Is my license included? How about ammunition? There are many choices out there, so identify these needs up front. Budget - How much am I willing to spend? What do I get in my package, and how much will I still be responsible for? How do I find a good outfitter? Most of today's outfitters know the importance of having a strong online presence, and simply by searching with a few key phrases will help give you a lot of information to dig through. Review the information they have online, and if you are interested, fill out their contact form for additional information. Another great way to gather information is to attend any local or regional outdoor trade shows. These usually are scheduled for sometime between January and April. A lot of outfitters exhibit at these shows as a regular part of their marketing plan. They know that tens of thousands of people will be in attendance over the length of the show, and almost all of them are pre-qualified prospects! They will have brochures, videos, and many, many stories to tell about their outfit. Gather the brochures, but ask a lot of questions. Watch the outdoor TV shows on local and satellite/cable programming. A lot of the outfitters will be featuring their offerings, and here you will get more of the visual information that you may need. Going through ads in magazines like Pheasants Forever, Upland Almanac, Outdoor News, Grays Sporting Journal, or any other outdoor publication can help. It can be a bit more cumbersome trucking through paper pages, then looking up more information about the outfitter online if they provided a website link... which they should without question! When you have identified potential outfitters, the next step is to contact them and get the questions answered. Ask for references-these people are a valuable resource for information too. Don't be impulsive either. Of course these outfitters are going to tell what a great operation they have, but in their line of work if you provide a bad experience word gets around. From the hundreds if not near a thousand outfitters I have met and talked to over the years at trade shows, almost every single one of them understand their customers needs and have a proven track record of meeting those needs successfully. I would start with the outfitters on this site. Since we hunt with them, we know the quality product and service they provide. 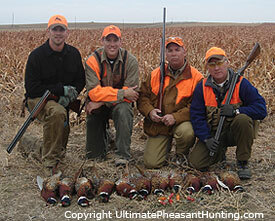 Here is a list of our feature pheasant hunting outfitters. In summary, do your homework, and don't rush to a decision. Ask questions, talk to friends and hunting buddies, and references given to you. Make sure you feel comfortable with your selection, to ensure that you have a memorable hunt of a lifetime!